Only a fool could think we can pump all that CO2 into the atmosphere and for the climate to remain the same. Also only a fool would look at individual anecdotal examples and extrapolate that out into "data". The science is unequivocal one important fact, if we don't reduce the amount of CO2 pollution our climate will continue to change. The economic, social, and political effects of reducing CO2 now will be far less dramatic than waiting until countries' resources change, and then trying to deal with climate refugees and conflicts. You think wars are bad now, wait until people need fresh water or previously productive land becomes desert. Hi Tess, I'm not sure what the effects of man-made CO2 inputs, and it is common sense not to pollute. The point of my post though did cover some of your points, but targeted in the other direction. 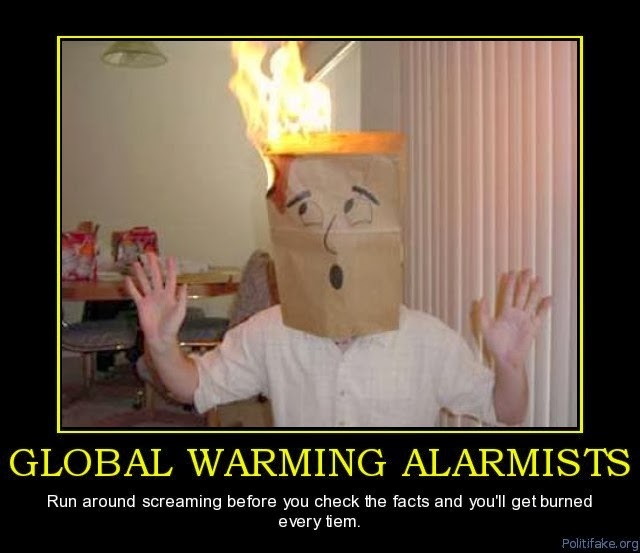 All of the "anecdotal" evidence on extreme weather events that is used to prove Global Warming is ignored when the anecdotal evidence points in another direction. Can't have it both ways, surely. The link to year on year pronouncements that there will be no more Arctic Ice proven wrong repeatedly would suggest that the scientists making these (later proven to be) wildly inaccurate claims would suggest that one would be a fool to keep believing them without ensuring the "proof" becomes a little more rigorous. The economic, social and political effects of reducing CO2 now are not fully known, because no country is making any real effort to reduce the effects of CO2. However, a lot of people are angling to gain a level of power to make sweeping changes that would have huge impact to people's lives and their actions may not correlate to an improved outcome. "You think wars are bad now"
I do not accept that the answer to Global Warming is to appoint another Stalin, Hitler, Mugabe or Pol Pot. The logic from some people is that the threat of AGW is so scary that we should be willing to hand over power to anyone for any reason, providing they are promising to save us from ourselves. On that score, the POLITICS is certainly not settled. And my links indicate that the science that was supposedly settled certainly have made a lot of false calls to date. They really need to get their act together and stop making outlandish claims that get disproved so easily. What do you both feel about this article ? What he says sounds sensible to me but then maybe both this man and yours truly are fools Tess? Just interested. It tells me the science is not settled. It also tells me that we don't really know what might happen to the climate and thus the effects - we could head back into another ice age, the sea levels could rise another 30m, we could have another 1,000 years of the current situation - either way, we'd all have to adapt. Separate to that is a discussion about sustainability and using limited resources wisely. Those kinds of discussions and improvements to our way of life have been happening since man could rub sticks together and make fire. We can be doing a lot more to ensure we look after our environment, but it doesn't need alarmist rhetoric to justify various extreme demands that only distract us from getting on with more productive conversations. I am in complete agreement that anecdotal evidence is useless either to support climate change or to debunk it. Either way you have to look at the long term trends. Weather isn't global climate, and weather events as individual things don't show us the wider trends. I'm not suggesting dictatorships or fascism or communism to deal with global pollution, but people do need to be responsible stewards of the environment - God told us to do that. Humanity needs to come to a workable solution that protects the environment and shares resources in a just way. I'm not a scientist, but my friend, who is a scientist in the Ecosystems and Global Change team for Landcare Research, is sure that climate change is very, very real. I'm going to take her word for it based on the fact that this is her field of expertise, rather than read a website. She's a scientist, she's not a politician. Climate change is real and all the hand waving and denial in the world isn't going to stop it. We need workable, realistic solutions to reduce the amount of pollution we are creating. Thank you both for your responses ... Tess, you say you are quoting your scientist friend who agrees with the global warming /climate change theory ...there are many scientists who do not agree with it, as this linked article states ... even some who used to agree. .. We do have to take care of our world and its continued growth for sure . We see in some countries people searching through piles of rubbish for possible food scraps whilst in other countries so many people throw out excess food .. though I guess that is not exactly on topic though. There are lots of scientists who don't agree, but I have one question, how many scientists who specialise in _climate_ disagree with climate change? Science is a massive field. My friend is a climate scientist, not just any scientist. I realize you are not suggesting totalitarian governments to deal with global pollution. I'd suggest you look at what others are suggesting to save us from climate change. When you say Climate Change, I presume you and your friend specifically mean "man-made global warming". When you say "pollution" I hope you are not defining CO2 as a pollutant. That was the first sign the science had been hi-jacked. The amount of CO2 we are pumping out is IMO a pollutant, especially given the amount of deforestation there is. Perhaps pollutant is the wrong word, perhaps I should say that it isn't a pollutant, but rather something that drives a change in climate. And here's one of many articles calling into question the assumptions based on the estimates based on the approximations: http://chiefio.wordpress.com/2009/02/25/the-trouble-with-c12-c13-ratios/ . We can't even tell what is man-made and what is natural, when it comes down to it. The IPCC data on volcanic emmission levels is also highly questionable (understated so more weight can be assumed to come from man-made sources). That aside, what do you think is the next step. Banning coal perhaps? I think pollutant is definitely the wrong word, but it's the word now used by the AGW community to suggest that feeding plants only has down sides. On the other hand, too low a CO2 figure and all plants die. At least the AGW scientists discount any possibility of us getting down to a plant-lethal 180 ppm. We could stop ALL CO2 emissions tomorrow and see no change in the planet for the next 1000 years (unless other non-man made factors play a bigger role than AGW science predicts. The science is settled? if only. I have been following following the issues and science arguments: the case for human driven global warming is not proven. It would be demolished in any competent law court, as happened in the UK when it was challenged as fact to be presented in schools. The IPCC have a political mandated task to position the UN members on climate change. They publish political papers first (The Summaries for Policy Makers) and the 'science' tomes are written much later to agree. We have not had the science behind the latest AR5 report yet. Draft staments have been intercepted showing revisions to argue a case through data manipulation. The revision of AR5, Chart 1.4 may be the future cause of legal action for deceipt. The is a current scramble to write papers speculating where the 'missing heat has gone', academics wont let it go and they cannot deny there has been no warming in 17+ years and by some counts now over 23. Meanwhile the sun has flipped its magnetic field and solar activity is at at low. The real worry should be whether a gas, which forms a miniscule part of out atmosphere and feeds all plant life on earth and also which is emitted, in much larger quantities than all humans combined, by the insects, is diverting us managing that over which we do have actual control. To deny people sources of heat and fuel and to demand that others change their lives requires much more solid evidence that we now have.Computer models are not facts or evidence, they are an expensive equivalent to journalists interviewing keyboards. The global temperature has stayed within 3/10 of a degree Celsius over a century that represents a regulation within 1/1000. That is an awesome regulation. If we do not consider also the possibility that the lack of movement in the measured temperature records represents a turning point, and there are many scientists concerned about that, and we are now in for a long and substantial downturn, and we are caught willfully with diminished energy resources, we are Biblically foolish. Weather is not climate: we will see up and downs but the IPCC gives us hope, climate change is very unlikely to be the cause of the spectacular weather events we see reported. Take heart and hope we have a creator God who is not going to destroy us through run-away climate change. We have to be careful not to destroy the rights of others by acting as if that was the case. Put on your woolies and adapt and don't deny others their blankets.. Does anyone else find the order of the comments a bit confusing ? they used to appear in order as they were posted but now they seem to jump around in no particular sequence ... or am I missing something? Of course the science isn't settled. That's the nature of science, always open to revision, correction, new hypotheses leading to new or modified theories. Anything else is dogma, and that is where the churches are stuck. Interesting that the only 2 scientific theories constantly attacked by the religious are climate change and evolution. "Of course the science isn't settled" - that's the complete opposite of what some of the scientific experts are saying with regard to AGW. They are very dogmatic about it. One of the points of my post. Nice of you to agree with me on that score. As for your other statements, wrong and wrong again. Religion and philosophy takes a different approach to discussing some of the big questions around the meaning of our existence, and the scientific method is not always useful in matters of philosophy, as you probably realize. You also probably realize that many religious people don't have a problem reconciling science and religion. Evolution may just be one of the ways God chooses to work. Some of the so-called attacks on evolution though could be considered critiques - evolution remains an incomplete theory with many gaps and puzzles. Science should be open to the critique, it encourages debate and free thinking. Let's stick to the topic of the post though LRO - please don't hijack the thread and bang on about your personal issues with religion and all of the strawmen that come with your baggage. You've plenty of room on other posts for that kind of dogmatism. And yet, philosophy, like science, is open to correction and change. But what do you do when god is wrong? Some of the so-called attacks on evolution though could be considered critiques - evolution remains an incomplete theory with many gaps and puzzles. Science should be open to the critique, it encourages debate and free thinking. No, an attack is not a critique. Demanding religion be taught in a science class is not a critique. Inventing sciency sounding but utterly meaningless terms like "irreducible complexity" is not a critique. But other than that, science IS open to critique. Is religion? What discoveries have been made by religion in, say, the last 50 years? I said "so-called" attacks. You continue to equate apples with oranges. Actually, it's more accurate to say you argue that apples should be oranges. It's just wasting everyone's time.